Check that the members match the Results from the Saved Search from above. Check the Email as Sales Rep box if you want replies to email generated by this template sent to the sales rep assigned to customer recipients. If you check this box, each campaign email message shows the nickname and From email address entered by the rep at > > Set Preferences > General under the User Profile heading. If the rep does not have a profile set up, the marketing email address and From name entered on the template record are used. Note - This preference overrides the reply-to email address you set on this template. In order to set-up the campaign to execute (send email), you must change the Status from Not Started to Execuite. 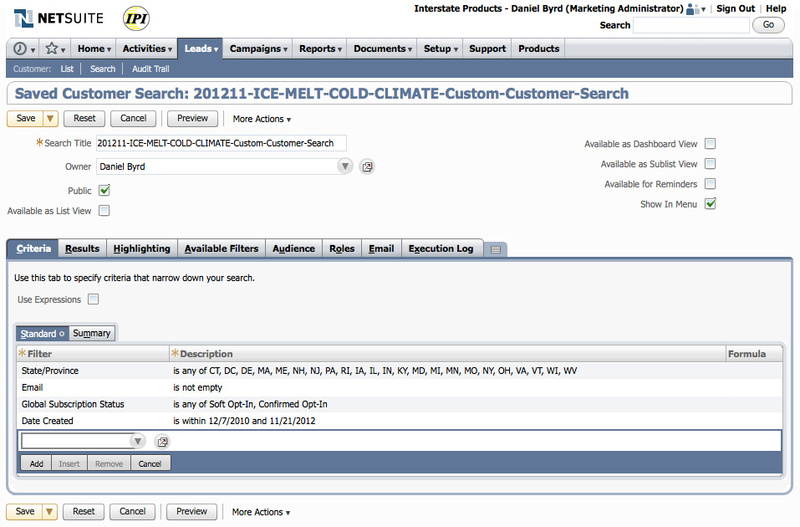 This will send the email template to the list of dynamic group members, from the customer, or contact, saved search. Next time I will use a PROMO code to better track conversion. Right now, I’m using a CUSTOMER group, and trying to re-sell to existing customers. Problem is, NetSuite constitutes a “Purchaser” as a lead converted to a customer, not a reoccurring customer.